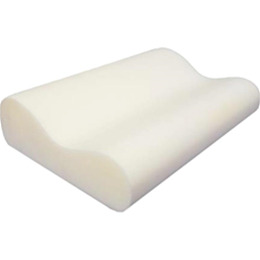 The Contour's Pedic Pillow has an orthopedic shape which cradles your head and neck to ensure proper spinal alignment to relax stiff necks, comfort sore backs and help relieve muscle stiffness. Made of a unique temperature sensitive memory foam which uses your body’s heat to active the molding process, creating a personalized fit. Enjoy the luxurious feel of memory foam as it conforms to fit the unique shape of your head, neck and shoulder area for custom support and unparalleled comfort all night long. Enjoy soothing support that molds to fit the shape of your head, neck and shoulder area for customized comfort all night long. Temperature sensitive material reacts to your body’s temperature to create a personalized fit. Orthopedic shape ensures proper spinal alignment for proper sleep posture. Machine washable, unzips for easy removal.